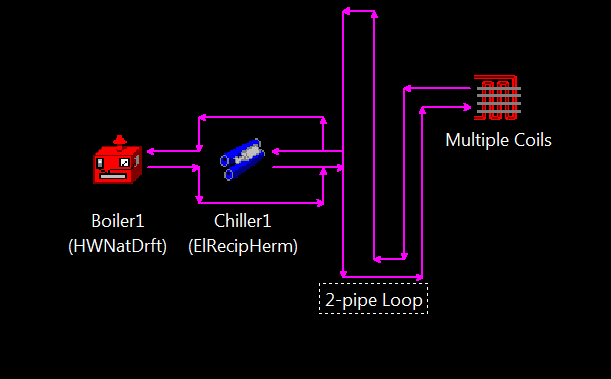 I haven't done a 2-pipe system in eQuest for some time, but to my recollection the actual "Fan Coil" (FC) system is pretty limited in that you can model a ventilation component (and preheat), but not a central fan or pre-cooling. It's very much a self-contained system. With this setup, you'll likely need to make adjustments to your terminal units (as defined at the zones) to behave like your actual fancoil units with respect to fan control and so forth.... But a quick simulation of what I just threw together per the above screengrabs simulates without substantial unmet hours or errors. Hope that helps you both move forward! i am collegue of Frantisek working on the same issue. The system that is designed by design team is AHU with heat/cool coils and then just 2-pipe FCU as a secondary cooling for offices. And baseboards/radiators for primary heating. I don't see a problem with baseboards because we can combine them togather with 4-pipe FC, VAV etc. The problem for us is how to combine 2-pipe secondary cooling FC togather with ventilation system (AHU). The strategy of creating narrow perimetr zone sounds interesting but i dont see a problem with baseboards at this moment. Further to that last point, I've often defined relatively narrow perimeter zones specifically to account for perimeter baseboard heaters. If you pursue this strategy, I suggest being very careful to define appropriate interior air walls with the adjacent interior spaces to aid in heat transfer, and/or else re-appropriate some of the interior loads of the core areas to the perimeter zones, to avoid erroneous unmet heating hours from those zones. For items 1 & 3, one of the HVAC systems available is fan-coil. This will allow for both a central AHU with your pre-heat and pre-cool. 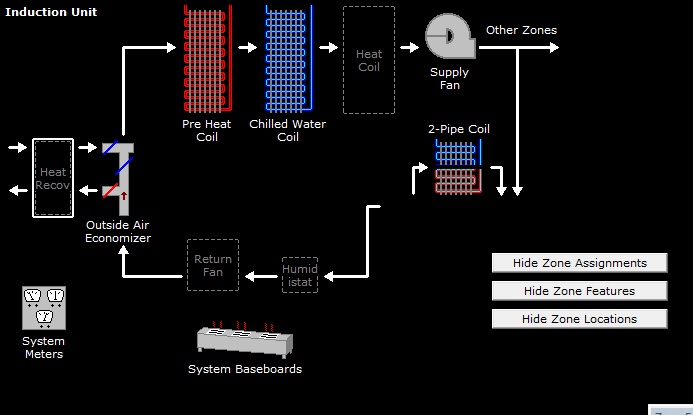 In wizard mode, you can select 4-pipe fan coil by setting the cooling source to chilled water coils and heating source to hot water coils (and can tweak this later in detailed mode if necessary). For the baseboards, you can turn on baseboards for zone heating in wizard HVAC screen 6, though I don't think these account for the fan energy. Another option would be to split up your zone and select unit heaters for those areas (e.g. stairwells, vestibules) if you can split it up like that. All these are for 1 zone. My question is - how to model this as equest allows only 1 HVAC system per zone?